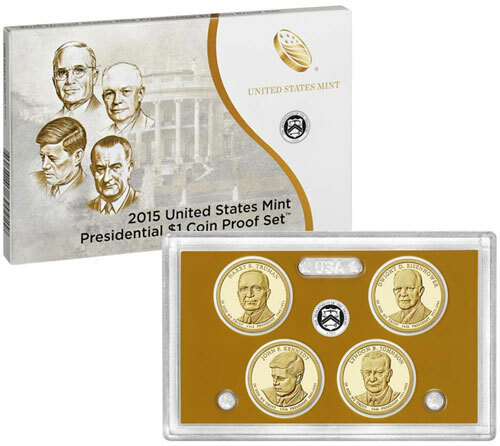 The United States Mint has started accepting orders for the 2015 Presidential $1 Coin Proof Set. The product includes coins honoring the 33rd to 36th Presidents of the Untied States of America, Harry S. Truman, Dwight D. Eisenhower, John F. Kennedy, and Lyndon B. Johnson. Proof coinage is manufactured by the United States Mint through a process which involves striking specially treated blanks multiple times with polished dies. This produces extraordinarily brilliant coins with sharp relief. Modern proof coins feature frosted design elements against mirror like fields, which creates a special cameo effect. The four coins included in the set are struck at the San Francisco Mint and carry the “S” mint mark. The coins come packaged in a single plastic lens, which allows both sides of the coin as well as the edges to be viewed. The lens is placed in an illustrated outer box along with a certificate of authenticity. This product represents the first availability of the 2015 Presidential Dollars in proof format. These proof coins will also be released within the 2015 Proof Set and 2015 Silver Proof Set later this year. The 2015 Presidential $1 Coin Proof Set is priced at $18.95. There are no product limits or household ordering limits imposed. Orders may be placed online at http://catalog.usmint.gov.